IC 1318 is commonly known as the Butterfly Nebula. Its distinctive shape is due to the band of dark nebula - LDN 889 - that bifurcates the emmission nebula. 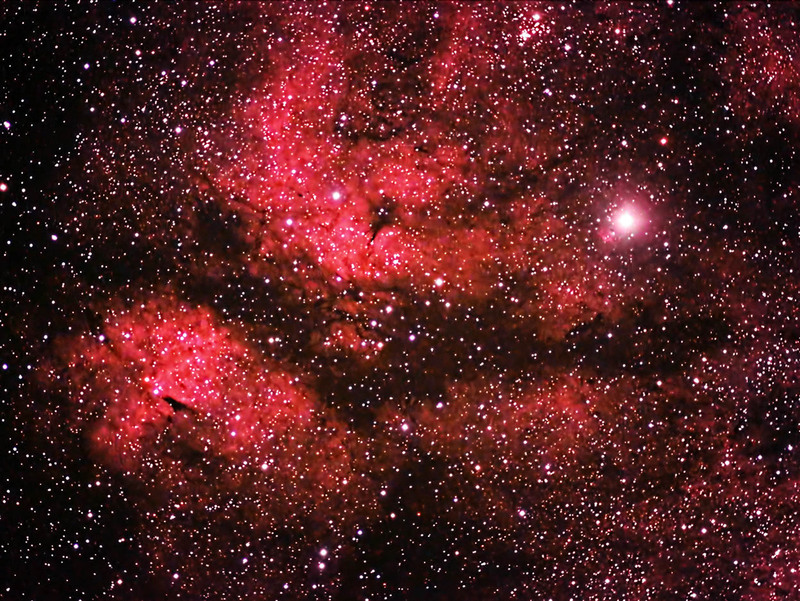 Other dark nebula are visible in the image. B 347 is the small dark nebula at the center of the lower portion of the Butterfly. B 343 is the dark nebula off-center in the upper portion. The open star cluster at the upper right is NGC 6910. This nebula is between three and five thousand light years away. Each lobe is approximately 50 light years in diameter. The bright star toward the upper right is Sadr (Gamma Cygni). It is not actually associated with the nebula as it lies much closer to us (a mere 1,800 light years away). Exposures: 20 @ 5 min. Processing: Images were focused using the camera's live view. They were aligned and combined using ImagesPlus. The composite image was adjusted in Photoshop. Topaz DeNoise was used to reduce noise. Note: Taken from my backyard in southeastern Minnesota on 10/11-12/15.